The scene: interior, daytime, Milan. Two empty mint green dining chairs sit next to each other. Pale sunlight bounces off the 1950s-era silver napkin dispenser on a square blue table. An old jukebox featuring classic Italian crooners leans against the wood-paneled wall next to a pair of pinball machines. The pink speckles on the floor match the pink sugar packets, each of which is labeled in elegant cursive with the name: Bar Luce. The whole scene is quirky, adorable, and unbelievably Instagram-able. “Is this a dream?” she asks. Bar Luce is about as close to a movie set as you can get without going through hair and make-up first. 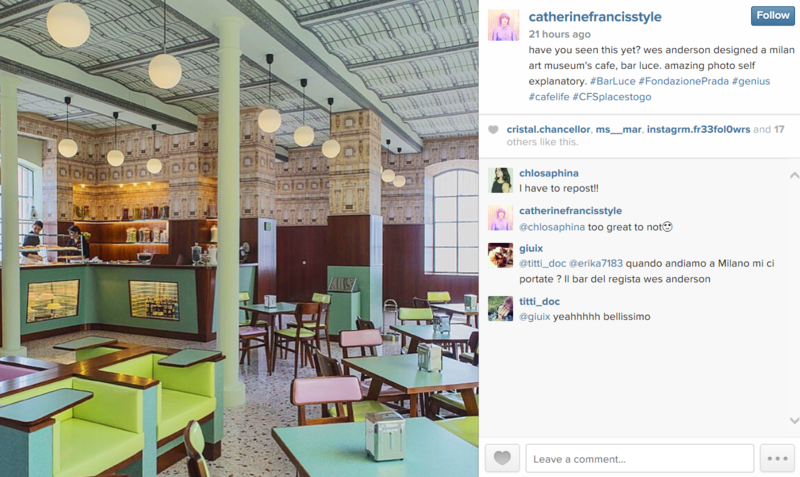 Oscar-nominated film director Wes Anderson designed the café, staying true to the unique aesthetics he applies to all of his movies: muted pastels, symmetrical sets, prominent furniture, and rich textures, all with an element of child-like whimsy. The café is truly an immersive brand experience for patrons and movie fans alike. In terms of marketing, Anderson’s Bar Luce is built on a strong brand foundation the acclaimed director has built over many years. His brand identity has certainly morphed over the past decade, though there are patterns present in all of his works that fans eagerly anticipate. Time magazine noted not many directors have accomplished what Anderson has in terms of consistency over the years. Storytelling has always been relevant to marketers. Print, television, and internet ads all need to tell a specific narrative tailored to brand audiences and be designed for the different mediums. However, the two-dimensional story trend is winding down, and a fully immersive, three-dimensional approach is taking flight. Consumer audiences are looking for real-life, relatable experiences now more than ever. Event Magazine listed immersive marketing as one of its top trends advertisers must utilize in 2015. This approach engages consumers unlike any campaigns before it. While interactive ads are certainly engaging, customers can’t download tangible experiences onto a smart device. They can, however, turn their live interactions with a brand into promotional material for businesses. 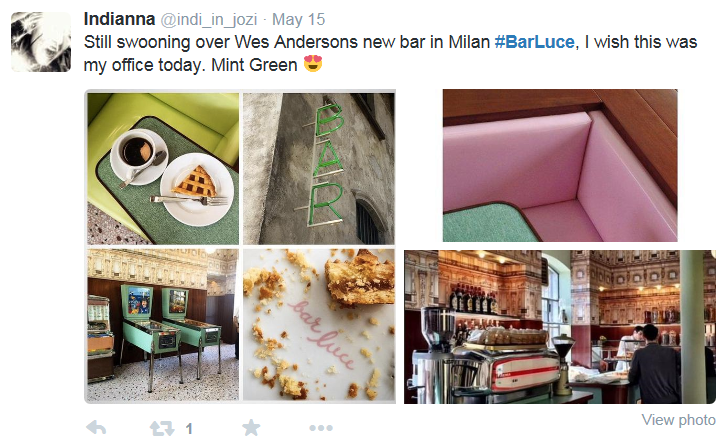 Converting customers to brand advocates is as easy as introducing a Wes Anderson fan with a smartphone to Bar Luce. They feel like they’re sitting on his movie set or conversing with other actors in a film, which is an exciting and real human experience even though there are no cameras rolling. Well, no professional cameras, anyway. The hashtag #barluce has already been tagged on 600 Instagram photo and video posts and countless tweets, including one user who posted a list of clothing items to wear to the café. If you’re going to sit on the Anderson set, you better look the part. Where immersive marketing focuses on plopping consumers into the middle of a real-life story, experiential marketing hones in on providing an in-person, specific, targeted, and lasting interaction with customers. It’s a message consumers can reach out and touch. Take Carlsberg’s newest campaign in London. Econsultancy reported a large billboard with a beer-bottle-green background and large white letters that simply conveys: “Probably the best poster in the world”. It seemed unusual until residents realized a beer tap was located in the middle of the poster at street level, where passersby could pour themselves a pint. It didn’t take long for a queue to form in front of the poster on Brick Lane. According to Event Marketing Institute’s EventTrack study, marketers increased spending on experiential marketing by 4.7% in 2013, and companies making more than $1 billion annually boosted spending by an even greater 9.8%. In a statement on Bar Luce’s official website, Anderson said the café certainly has the potential to be a movie set, though he thinks “it would be an even better place to write a movie”. The fact that Anderson’s most recent film “The Grand Budapest Hotel” won four of the nine Academy Awards it was nominated for in 2015 lifts this statement to glamorous heights and may lure aspiring screenwriters and artists to sit in Bar Luce’s mint green chairs, soaking up inspiration while designing next year’s award-winning costumes and hairstyles. The use of celebrity in marketing is also highly effective. With the right partnership between a public figure and a brand, businesses can boost sales and awareness almost overnight. The key to hiring spokespeople is making sure they fit the brand message. Anderson works well because he writes movies in cafés and can offer a kitschy twist on standard coffee joints. Someone like Derrick Rose of the Chicago Bulls, on the other hand, would be a less ideal option for a cute café. Rose’s partnership with Adidas, however, is both lucrative and engaging to the brand’s target market. Brands can leverage their unique brand identities and aesthetics to increase engagement and build meaningful relationships with consumers by creating immersive and experiential marketing experiences. Marketers should focus on giving the gift of tangible messaging and lasting memories rather than telling a two-dimensional story. 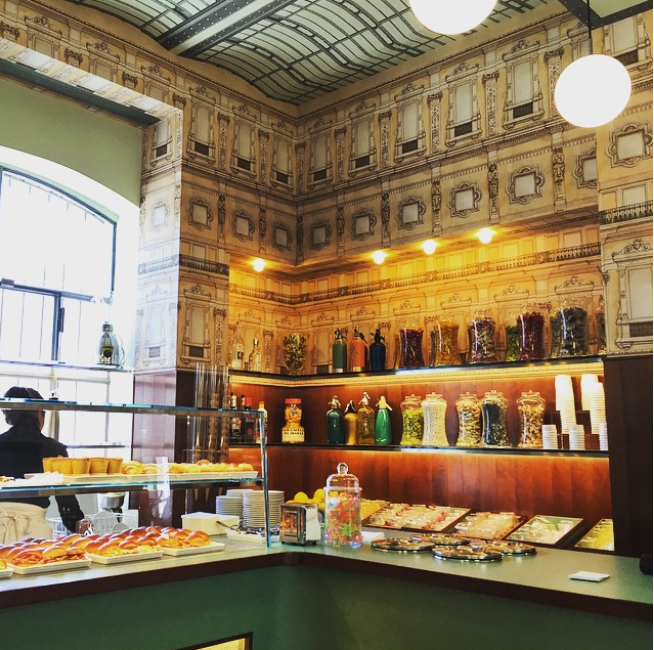 If Wes Anderson had stuck to flat storytelling, he’d probably be in a much less vibrant café today, still trying to work out his next screenplay. 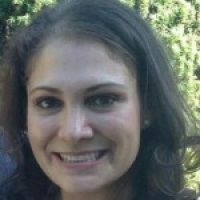 What is your experience with immersive marketing? Let us know in the comments below!